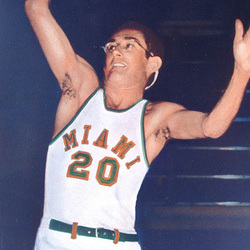 Sy Chadroff racked up nearly a dozen records on the basketball court during his three years at the University of Miami. Most of those standards have since been erased by modern basketball's accent on scoring points by the bundle. However, one record Chadroff set is likely to endure. Never was there a UM athlete who had so many nicknames. "The Bronx Bombsight"; "Windows"; "Shady"; "Shy Sy". There were others of a more intimate nature. Most of the monikers revolved around Chadroff's eyeglasses. The eight-inch lenses, which he wore at all times because he couldn't see the hoop without them, gave Sy an intellectual air. And obviously that wasn't altogether misleading for today Chadroff is a successful Miami attorney. Actually the glasses had a lot to do with the six-foot-three-inch New Yorker coming to Miami in the first place. After an All-City career at Christopher Columbus High School in the Bronx, Chadroff was given a scholarship at City College of New York. Nat Holman, the famed CCNY coach, didn't seem to appreciate Chadroff's talents. "He just couldn't get used to playing a guy with glasses," an aide said at the time. Holman's hangup was Miami's gain. Abe Friedman was the UM captain in 1948 and he persuaded Chadroff to come south with him that fall. "Abe came from the same neighborhood," Chadroff explained, "He told me Miami was the place to go. I didn't like living in the city and having to take the subway to practice each day anyway. I had never been to Miami, but as things turned out it was the best thing that ever happened to me." After sitting out a year of ineligibility, Chadroff became a first stringer as a sophomore and started every game (67) for three years. Most points in a game, 47. Most points in a season, 459. Most points in three seasons, 967. Most field goals in a game, 18. Most field goals in a season, 180. Most free throws in a season, 99. Best point average for season, 20.9. Best free throw percentage in season, 80.5. Best field goal percentage in season, 39.7. Chadroff's free throw percentage was best in the nation for the 1951-52 season when he finished 14th in total points. Two games stand out in Sy's memory. "In 1951 LaSalle was headed for a post season tournament with a 16-4 record and we beat them in overtime, 77-75," Chadroff recalled. "I remember getting a free throw to tie the game 7-70 after time had run out. I was trembling as I went to the line." A year later, Chadroff was captain. The big rival in all sports was of course the University of Florida and the Hurricanes had not beaten the Gators in basketball during his collegiate career. Sy invoked his role as team leader and made a short pep talk just before the Hurricanes took the court. That did the trick. Um ran to a 23-6 first period lead and coasted to a 76-68 victory. A year later, Chadroff was in law school and helping Dave Wike coached the UM quintet. Just prior to the season opener against Florida Southern, Wike was hit by a mild case of polio. Thus Chadroff became temporary head coach. He was successful here, too, as Southern bowed 83-60. Even after Sy earned his law degree, he continued as a basketball coaching aide. And the one year he tutored the freshmen they went undefeated in 17 games.